Note: This howto requires a patch to your FreeBSD ports tree. The patch has been submitted to the FreeBSD port maintainers. I hope that it will eventually end up in the ports tree. My initial readings about this was on the official Icinga docs covering installing Icinga on FreeBSD with IDOUtils. However, as it turned out, the docs our a bit outdated, and yet do not reflect a way of doing the install using ports. 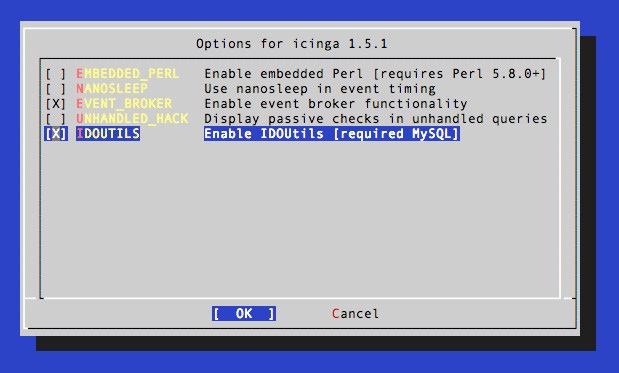 Now let’s turn to Icinga, which has a port on it’s own, which you’ll find it at /usr/ports/net-mgtm/icinga. First change to that directory. Now download the patch file I made into your ports directory. The patch will inject a new rc-script for ido2db and enable your port to build IDOutils. Hunk #1 succeeded at 27. Hunk #2 succeeded at 109. Hunk #1 succeeded at 4. Note the now IDOUtils option that now has appeared. Check it to enable IDOUtils. Then compile and install as usual. The port will install also all required dependies, two of them being mysql55-client and libdbi-drivers, both to be found at /usr/ports/databases. Afterwards, you should end up with a few additional files, which would not be installed with the stock FreeBSD port. 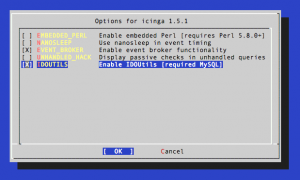 Of course, you still need to perform the usual Icinga configuration steps, which are not covered in this post. Please check with the official docs for this procedure. If your configuration is proper, you should notice this in your logs indicating that IDOMOD (IDOUtils) is really working. idomod: Successfully connected to data sink. 26 queued items to flush. idomod: Successfully flushed 26 queued items to data sink. Event broker module '/usr/local/bin/idomod.o' initialized successfully. That’s it, you conquered the beast!